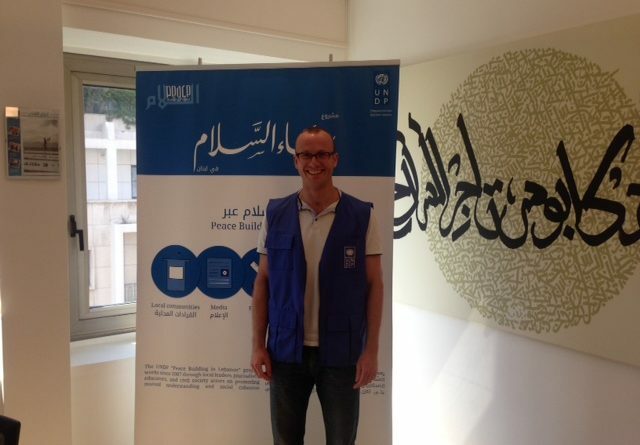 Thanks to the generous support of the Fares Center, this summer I had the opportunity to spend one month interning with UNDP Lebanon as part of the Tripoli Project. Based in Beirut, I supported the organization’s Peacebuilding Project where I worked on research in conflict resolution and memory politics. In this blog post, I will give a brief overview of my experience with UNDP as well as provide answers to some questions that I imagine would be useful to someone interested in getting involved with the Tripoli Project in the future. Why did I choose Lebanon? And UNDP? I had spent six months in Beirut teaching English prior to joining Fletcher. The experience was an important step in transitioning my career towards international affairs and conflict resolution. But after six months I felt that I had just started to gain an understanding of Lebanon (let alone the region) and I was eager to make my way back to Lebanon. Luckily, the Tripoli Project provided an opportunity to apply what I studied in my first year at Fletcher at an incredible organization in Beirut. When starting at Fletcher, I opted to take the Design and Monitoring for Peacebuilding pre-session course (or Fletcher bootcamp as it is known). This was my first exposure to peacebuilding content and was my basis for thinking of an internship in the field. When I heard that UNDP was one of the organizations which the Fares Center had built a relationship with for the Tripoli project, I was immediately confident that I wanted to apply for the internship. What kind of projects was I involved with? Most of my time was spent analyzing programs of a civil society organization that receives capacity building support from UNDP, Fighters for Peace (FFP). FFP was formed by a group of ex-combatants from the Lebanese civil war who are advocating for a truth and reconciliation process in Lebanon and provide outreach to local communities regarding conflict prevention strategies. Needless to say, FFP is a very interesting group who occupy a unique space in the peacebuilding landscape. I applied the skills from the D&M course to examine the design of FFP’s programs and then contextualize them within conflict resolution theory. What did I take away from my experience? My research into conflict resolution theory was genuinely a lot of fun to do. I was especially interested in theories examining cognitive changes and the restructuring of identity in post-conflict environments. One weekend we additionally had a team retreat in Tripoli where we discussed the nuances of the Bab al-Tabbaneh–Jabal Mohsen conflict with local analysts and Fletcher alumni. Overall, it was intellectually rewarding to have the time to apply a range of theories and analysis to one specific conflict. What would I recommend to other Fletcher students interested in becoming involved with the Tripoli project? Firstly, go for it! But to make the most of your time with the project, it will help to a good idea of how exactly you can contribute to an organization. My first-year coursework gave me knowledge of a particular area which I was able to apply at UNDP. Without knowing ahead of time what value you can add to a team risks getting involved with projects that may not be right for you. Also, while in Lebanon make sure to connect with the Fletcher community. The Fletcher Mafia is everywhere and are great people to grab a beer with (or perhaps some argileh! ).